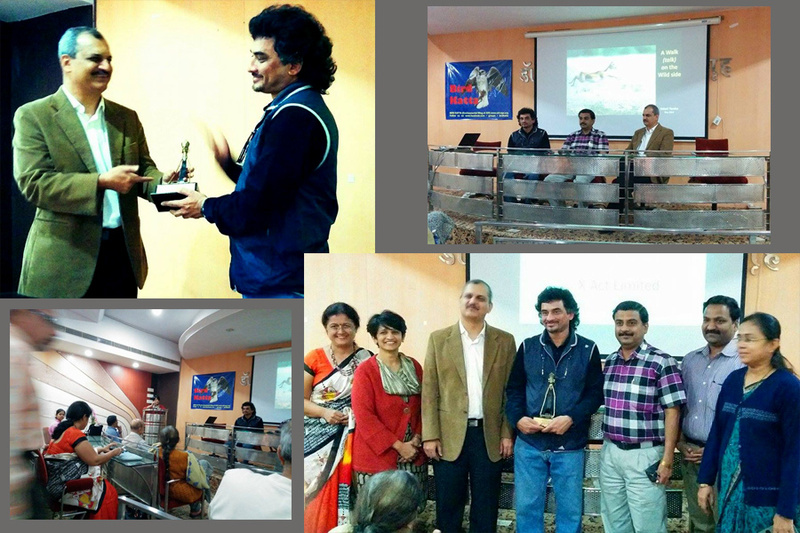 Oraganised in the Indian Medical Association Hall by Bird Katta, a nature lover group in Nagpur - Saleel presented a seminar on Wildlife photography. 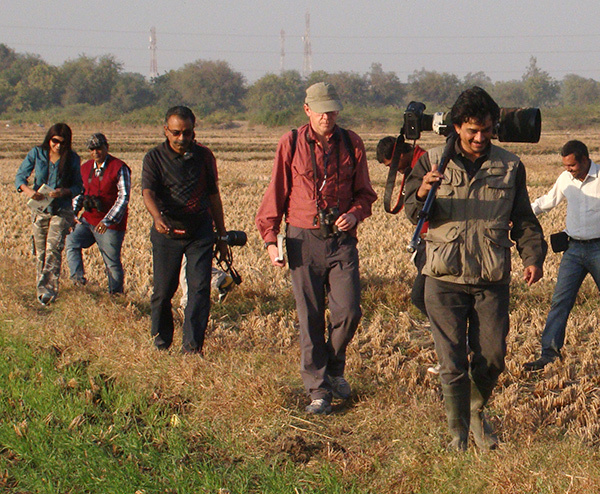 This interactive session was attended by nature lover doctors, bird watchers, photographers from Nagpur and surrounding areas. 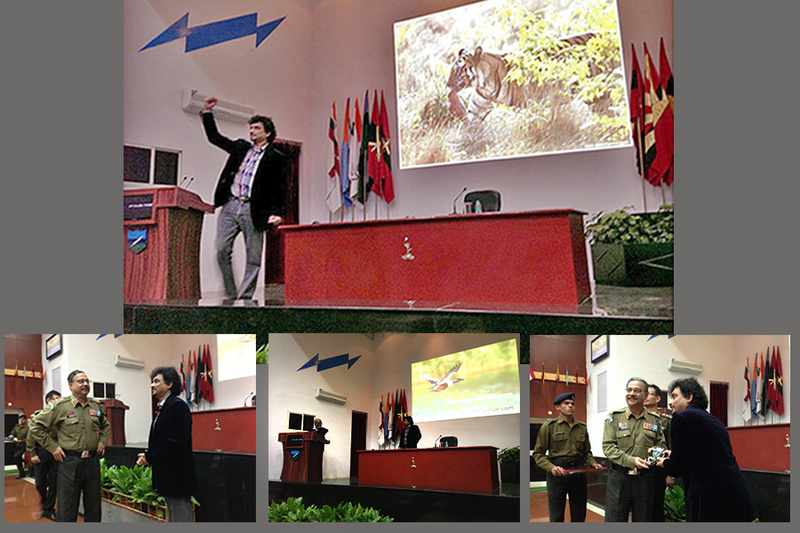 It was a privilege and honour to conduct a session in Army auditorium for MCTE at Mhow, MP, India. 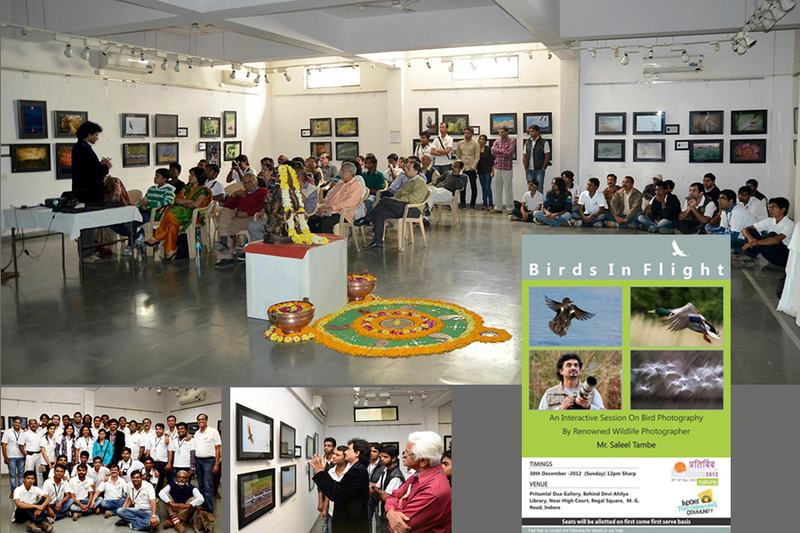 Session on Birds in Flight at Pritamlal Dua Art Gallery Indore, organised by Indore Photography Club. 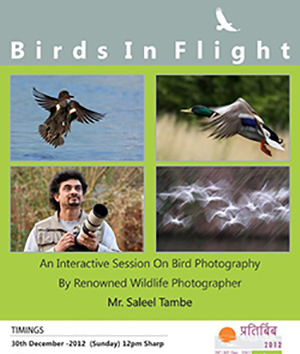 After presenting in the first year, Saleel is invited again for a session on Wildlife photography at the Global bird Watchers conference. Saleels photograph of Grey heron hunting a coot chick titled "Eat or be eaten" has been awarded the Sanctuary Asia RBS 2010 Wildlife Photography Special Mention Award. 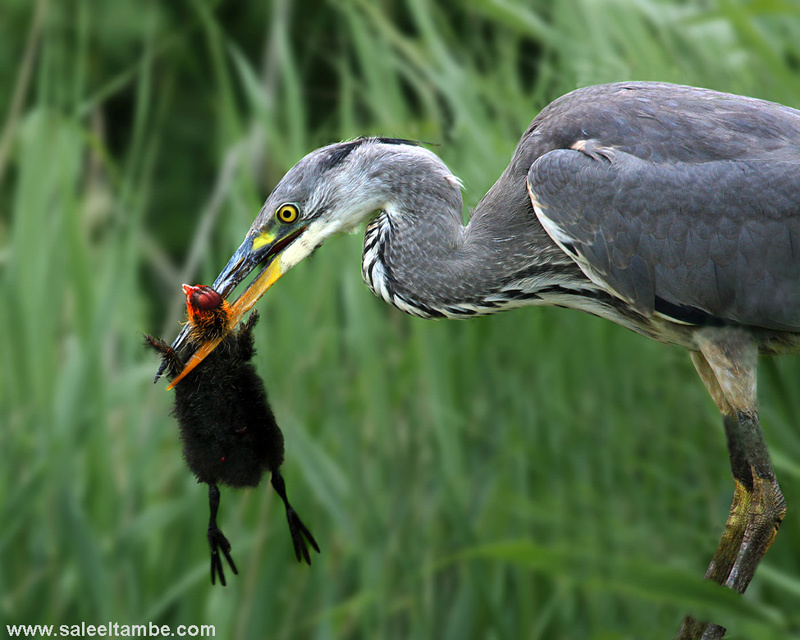 The death of one is the life for other - a law of nature. 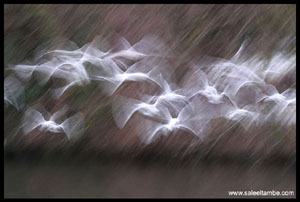 All the winning images can be seen on Sanctuary-Asia website. 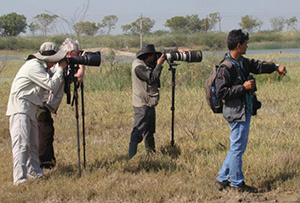 Saleel invited for a presentation session on wildlife photography in Global Bird Watching Conference (GBWC) 2010. 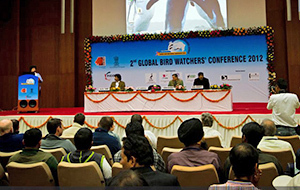 This conference is organised by Gujarat govt / Gujarat Tourism and FICCI. 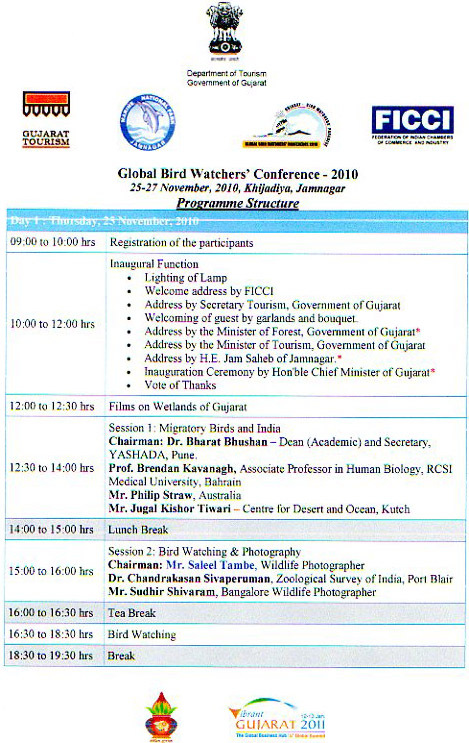 Delegates from various countries are attending this event which is scheduled on 25, 26, 27 Nov at Khijadia - a significant bird sanctuary in Jamnagar. 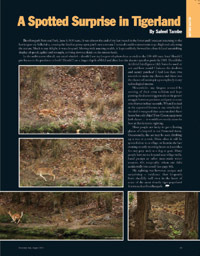 A photo feature based on Saleel Tambes photographs of Leopard hunt was published in the Aug 2010 issue of Sanctuary Asia. This issue was a leopard special. 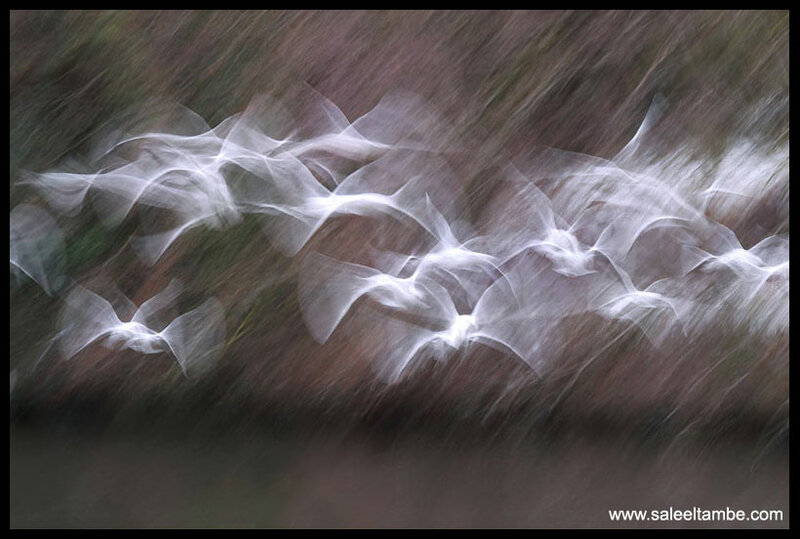 Saleels image titled -Return of the Egrets-is awarded the IOTY ( Image of the Year) - 2nd position in BPN (Bird Photographers.Net). 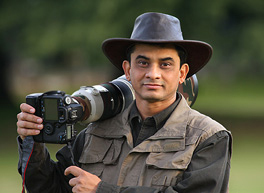 Feels good to see an image being declared -Image of the year- in a highly reputed forum - where thousands of images are posted everyday by experts from all corners of the... world.This is the most attended forums on Nature & wildlife photography and some top quality work is displayed here. 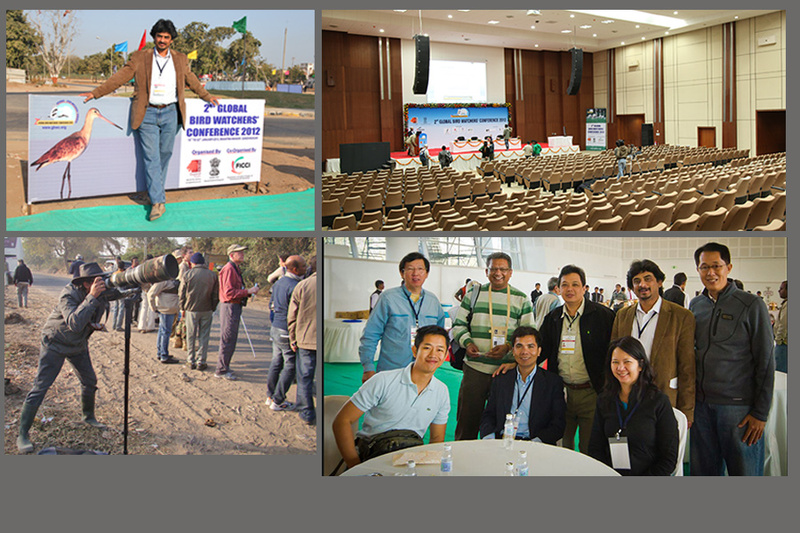 Commemoration of 60 yrs of Indias republic. 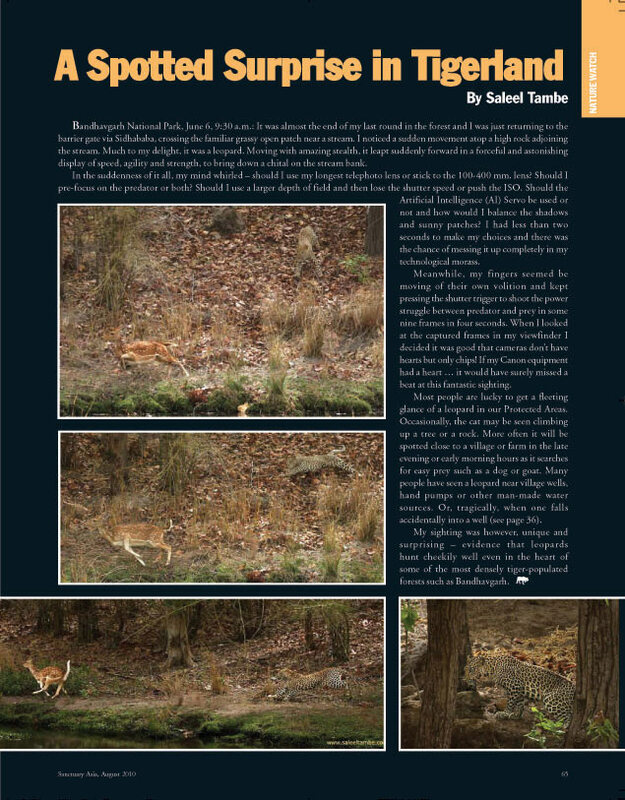 It was a proud moment for me to bring Indias wildlife and nature to a prestigious platform in the UK through my photographs. This exhibition was organised by Nehru Centre.It was a great delight to have Michael Palin at the inauguration of my photography exhibition at Nehru Centre London. 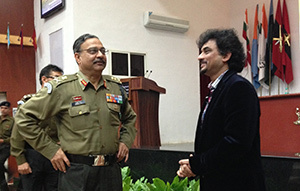 Other distinguished guests included-Shreela Baroness Flather, Michael Wood, Mr Suri - High Commissioner of India, Mrs Monica Mohta-Director Nehru Centre. 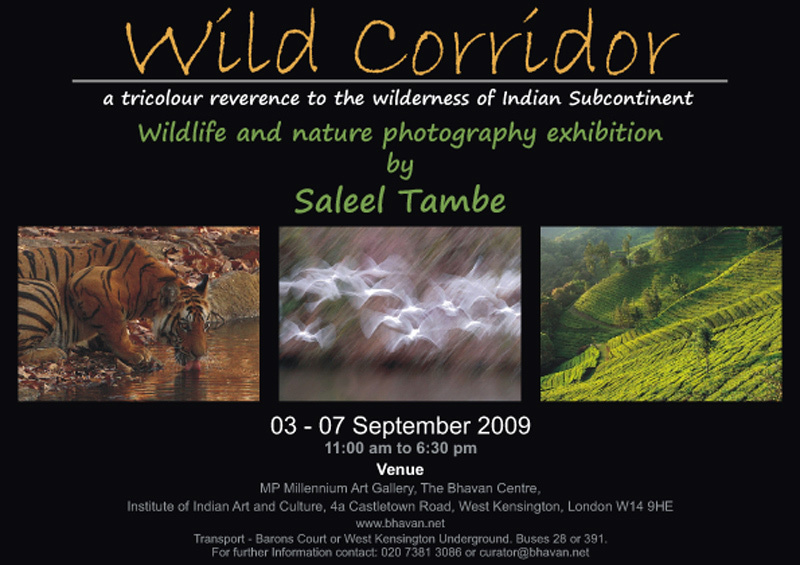 Wild Corridor is a window to the wonderful wild world from Indian subcontinent. 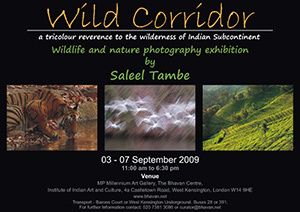 Through this exhibition of wildlife and Nature photography, Saleels lens brings out some splendid glimpses from the tropical habitat – which surely is an exciting tete-a tete with the astonishing biodiversity of India.Images in this exhibit are displayed in a three coloured theme – Saffron, White and Green – quite in line with the three colours on the flag of India flag called Tiranga (meaning Tricolour)-each of these three colours conveying a characteristic notion. 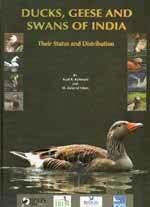 Saleel has contributed majority of photographs in this book and has contributed on the inputs for distribution and references of rare species. 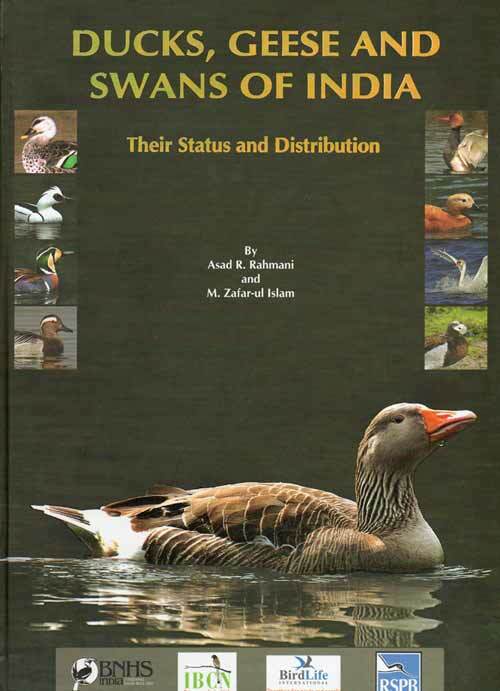 Authors - Dr Asad Rahmani, M. Zafar-ul Islam published by BNHS & Oxford University Press in collaboration with Birdlife international, IBCN & RSPB. 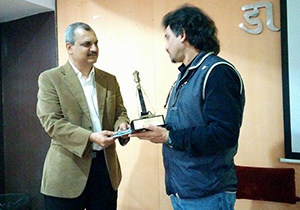 A quick collection of various awards and achievements for Saleel in early years.